In a previous post we questioned how we are to know how to manage finances, particularly when income and expenses go over or under budget. If we truly want to live out God’s purposes, design, and commands for the Church, we need to know His heart in all matters. We need to take a Christ-like approach to all we do, including financial matters. Prayer is fundamental to that kind of approach. Praying about Church Finances Follows Jesus’ Example. Communicating with and doing the Father’s will was most important to Jesus. (Jn. 4:34; 5:30; 8:29; Matt. 26:36-44). Jesus consistently set time aside to go to the Father in prayer about a variety of matters and decisions that had to be made (Matt. 14:23; Mk. 1:35; 7:34-35; Lk. 5:16; 6:12-13; 9:18, 28). Of utmost importance to Jesus was submitting to the Father’s will even when it would be unpleasant or would not be what He in His human state would want to experience (Matt. 26:36-44; Heb. 5:7). Prayer was a major part of that process. The Christ-like thing to do about budget and financial issues is to pray. How can we be Christ-like in church finances if we are not praying at every turn? The Christ-like thing to do about budget and financial issues is to seek and then submit to God’s will. How can we be Christ-like in church finances if we aren’t willing to lay down our own agendas for the Father’s? Praying about Church Finances Follows Jesus’ Instruction. Jesus spent a good bit of time teaching on prayer. He taught about its importance and the Father’s delight in answering prayers in accordance with His will (Matt. 7:7-11; 21:22; Mk. 11:24; Jn. 14:13-14; 15:7, 16; 16:23-24). 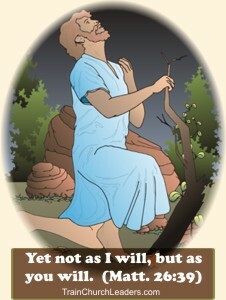 He instructed us to be persistent in praying (Lk. 11:5-8; 18:1-8). He gave a sample of how we might pray (Matt. 6:9-13) and gave instructions on our attitude in praying (Matt. 6:5-8; Mk. 11:25). Jesus emphasized the need for us to abide in Him in order to do anything of eternal consequence (Jn. 15:1-5). Prayer is a part of abiding in Him. The Christ-like thing to do about budget and financial issues is to follow His instructions about prayer. His own example backs up the words He spoke further substantiating the importance He placed on prayer. How can we be Christ-like in church finances if don’t obey what He says? The Christ-like thing to do about budget and financial issues is to trust Him implicitly to provide the right answers. How can we be Christ-like in church finances if we take matters into our own hands rather than seek and follow after Him? If the Church spent more time praying and less time fighting or obsessing over financial concerns, we would be more of a light to the world around us as we would be demonstrating Christ-likeness to them. As Jesus said, “You cannot serve both God and money” (Matt. 6:24).